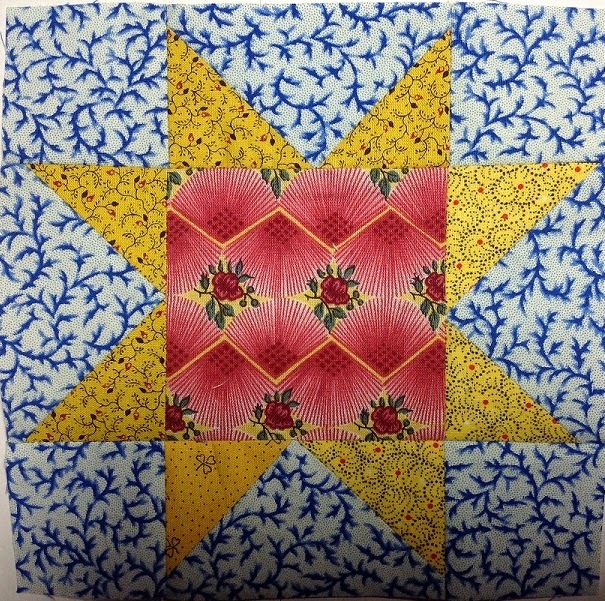 We have another star stitcher! My friend Karen Mitman (no Blog) has joined in the Stars in a Time Warp fun. Here are a few of her stunning stars. Keep up the good work Karen!! Let's bring them to retreat this year and make them into a quilt! A purple and white quilt for my nephew's wedding. (I'm sure he won't be reading this so I can post it). It isn't my really my style, but I know they will love it and after all, it is purple. But, I managed to sneak in a few of my own purple choices and made my little time warp stars. I love this one with a darker purple for the points and a nice madder background. 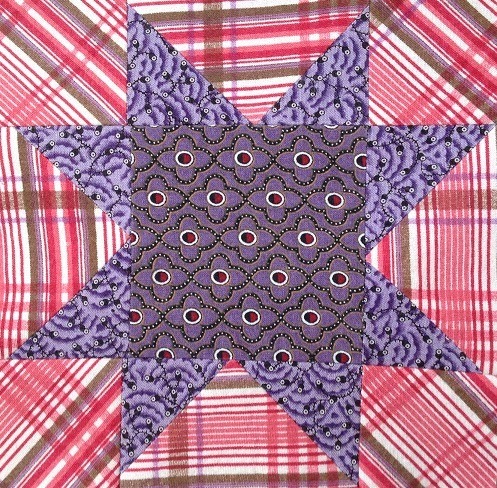 And then I used a more muted purple (almost lavender) and used that wonderful diagonal plaid (again) from Mary Koval. My friend Karen (no Blog) has joined in and I hope to share some of her stars soon. These have been a lot of fun and i love seeing what other people have chosen for fabrics. Makes me want to go shopping. And, speaking of shopping, if you are New England in April, Maine is having a shop hop. I will be spending Thursdays at my friend's shop, Busy Thimble, in Litchfield. So, if you are in the neighborhood, do stop by! Spent most of the weekend working on my nephew's wedding quilt. It's a bit modern for my taste, but I am beginning to like it. Anyway, I needed a break so yesterday I got out my most recent purchase from my favorite quilt shop (Busy Thimble) and made this little top. This wonderful diagonal plaid fabric is a Mary Koval print and I bought it in lavender too. 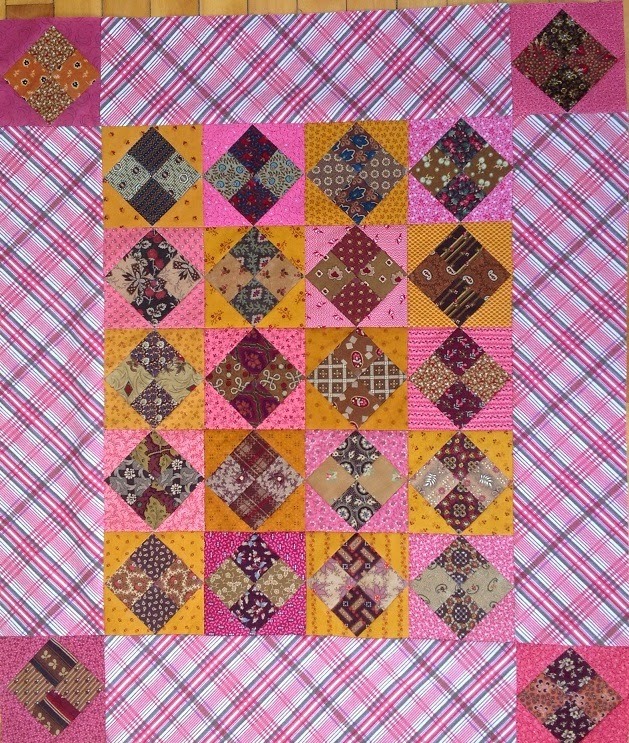 I had the brown 4-patches all made up so I just added some cheddar and pink triangles and voila! I don't usually use such a light print for borders but I think this works well. Thanks Mary for such another great fabric line and thanks Cyndi for carrying it! Quick post of my green stars. Busy weekend ahead but I managed to piece my two green stars. 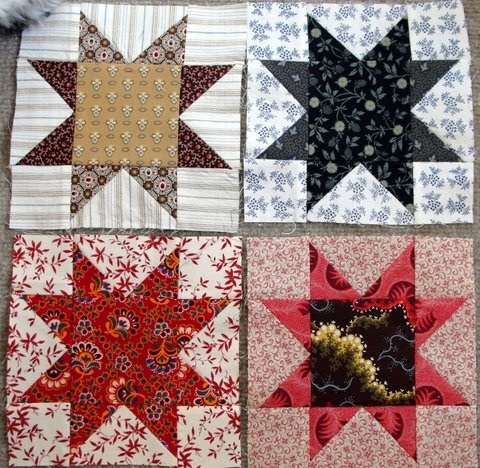 Once again trying to adhere to Barbara's suggestion to think like a nineteenth century quilter. It certainly becomes easier as I go along. This next one is my favorite. Like the Pennsylvania German's I too like using bright colors. Love the pink and green together. I have lived in Maine all my life, but I think I must have been born in Pennsylvania! Unless you are a quilter who loves reproductions like I do! Another of my favorites for this week's Stars in a Time Warp. I buy every piece of green calico I can find. I have quite a collection and I can't wait to make my stars! I love integrating these greens with other brights and some muted madders like this one that I donated to the Maine State Museum. And this one which has an even more "Pennsylvania German" look which I donated to my daughter's friend who had staggering medical bills after an operation. 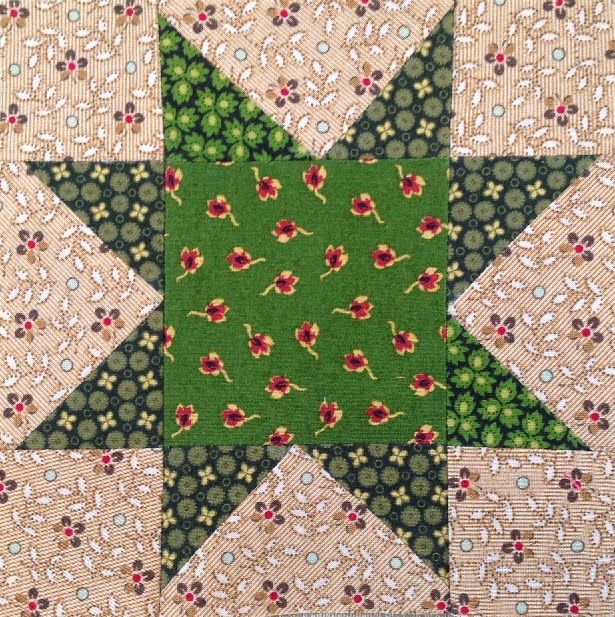 And I used a bit of it in this little "world piece" which I made a few years ago for the "New from Old" fund raiser for the Quilt Alliance. Now I need to make the stars! The temps are still low, but I can hear spring coming in every chirp of the tiny songbirds outside my window. I worked all weekend on a boring (to me, but surely not to the recipient) quilt for a wedding gift, so I thought I would post some pictures of quilts I have enjoyed working on. 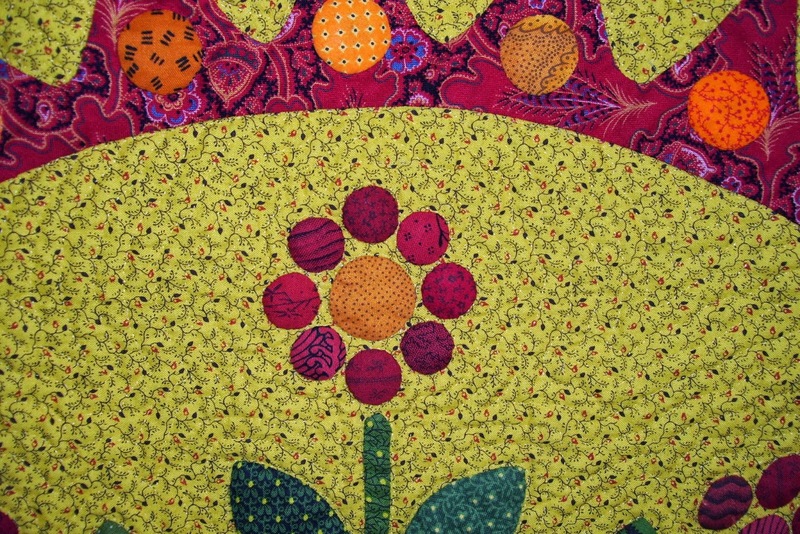 This cutie reminds me of a sundae dish so I quilted cherries and bananas and ice cream cones into it. It just looks like spring doesn't it? And if that isn't enough, here's some more yellow to cheer you up. 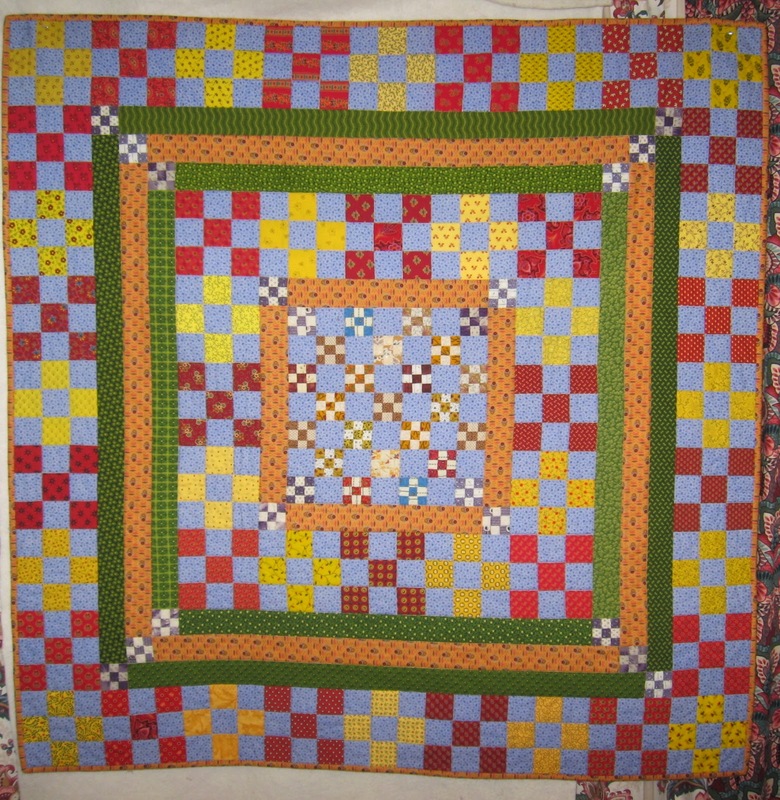 I hand quilted different motifs in each of the plain squares which was really fun. And this one is a tribute to the original maker, Florence Peto. 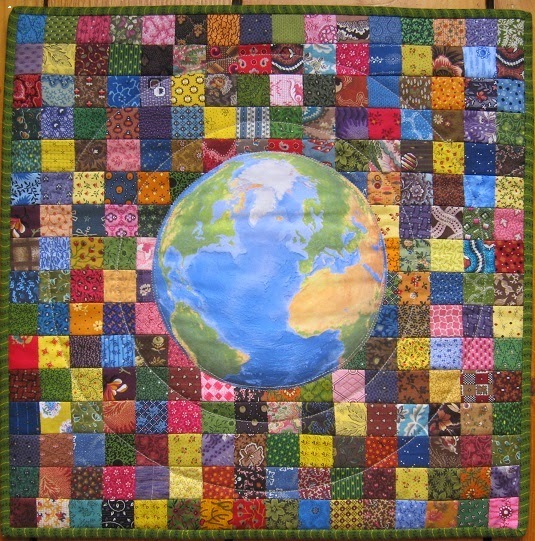 Several years ago, a few of us challenged each other to reproduce this quilt. Florence used antique and vintage fabrics when she made hers. Mine is made up of vintage feedsacks. 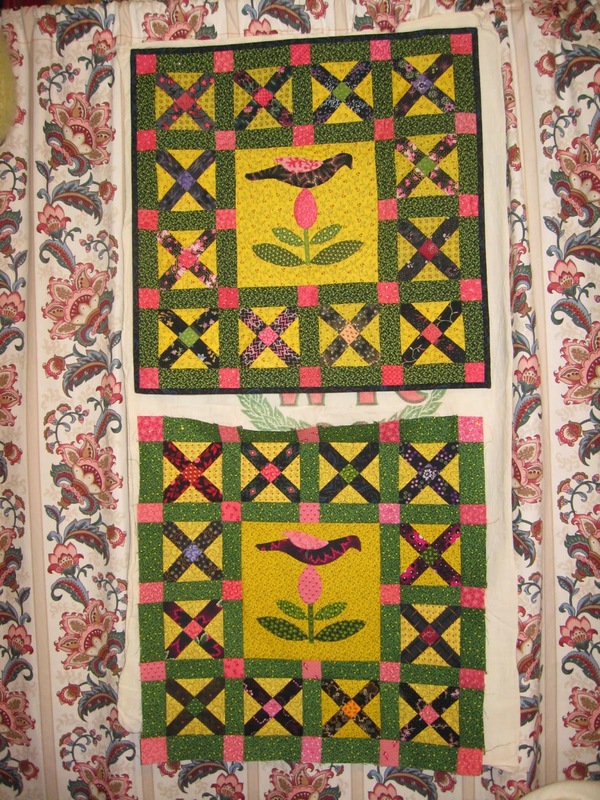 The Shelburne Museum in Vermont has several of Florence's quilts. They are a must see. Happy stitching on this (hopefully for you too) sunny day. My favorite stars to date. Love that yellow! First with a little Prussian blue background. 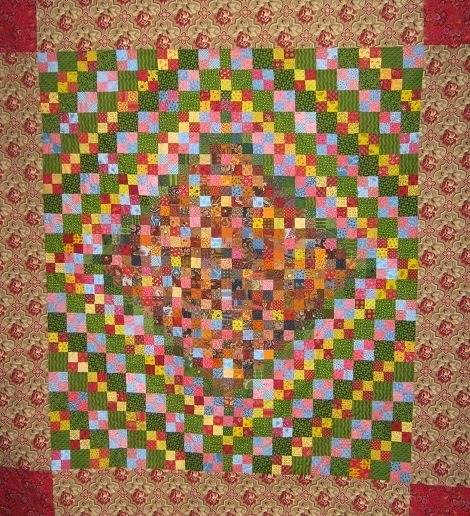 You will notice that I have kept with Barbara's suggestion of trying to think like a 19th century quilter. 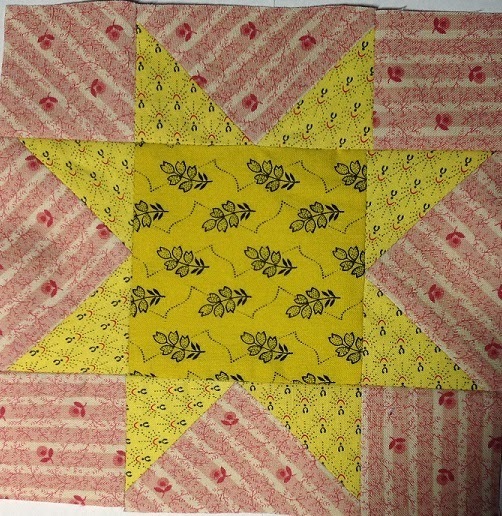 Using ever scrid (yes, that is an actual word, at least in my vocabulary) of fabric (even if the direction is wrong) in order to fit it into my block. Of course that means that where you see a point chopped off or a seam that doesn't quite match, I have done it intentionally because, after all, I like to follow rules LOL. AS I mentioned in my last post, I do love these yellows and have quite a few in my stash. I have found that they are almost always printed with a bit of red in them. ( A quick note on how lucky I am to have a good friend (Cyndi) who owns the quilt shop where I buy 99% of my fabrics. (Busy Thimble), Litchfield, Maine. If you will notice the two fabrics on the left are similar prints (based on a true antique fabric that I have in my possession, but couldn't locate this morning) from different manufacturers. When the fabric on the far left arrived at Busy Thimble it was almost neon bright. Cyndi took it all of the bolt, softly overdyed it, washed and ironed it and put it back on the bolt (with proper documentation!). Now that is dedication to true reproductions! This one is now much closer in color to the actual antique print. Lucky me!! You can occasionally find them without red, but then I love them all!! Oh goody! This Wednesday's Stars in a Time Warp color is chrome yellow, my absolute favorite! Since I have to work today and won't get to work on my blocks until tomorrow, I thought I would share some chrome yellow from a while back. Sorry the photo isn't great. This was an exercise I did a year or so ago. 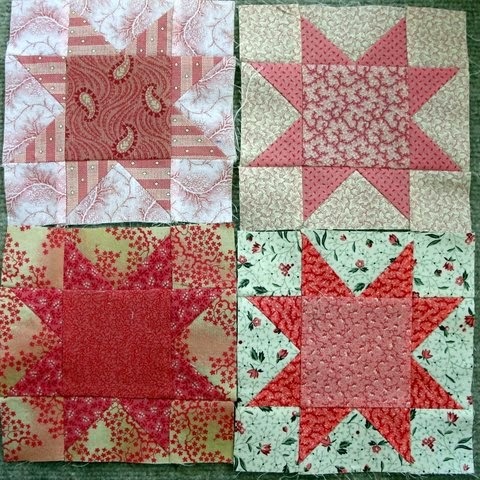 I made the top quilt from actual antique fabrics (c1880) and then made the same quilt in reproduction fabrics (the bottom one is the repro and is just a top in this photo). They were lots of fun to make. I had a few of these antique "luminaries" which we now call "neons" and I had a great time trying to find the reproductions! 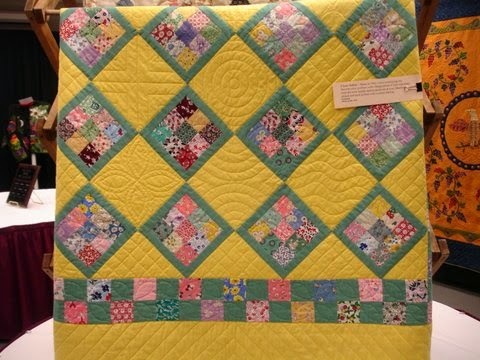 Here is a close up of my header quilt, for a little more "sunshiny" chrome yellow. Here are my indigo stars for this week's Stars in a Time Warp (I know - they are done before Tuesday night!). I love the background in this first one. 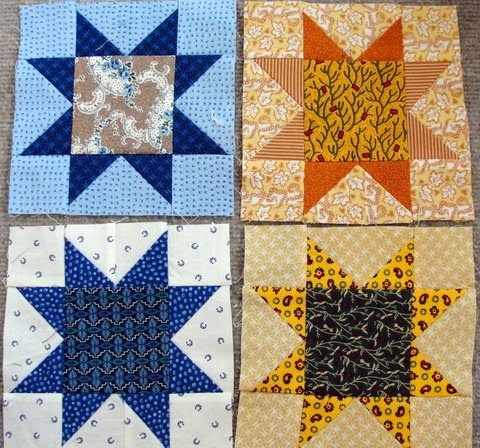 It's funny how I think I am such a "traditional" quilter, yet I am finding it hard to think like a 19th century quilter. 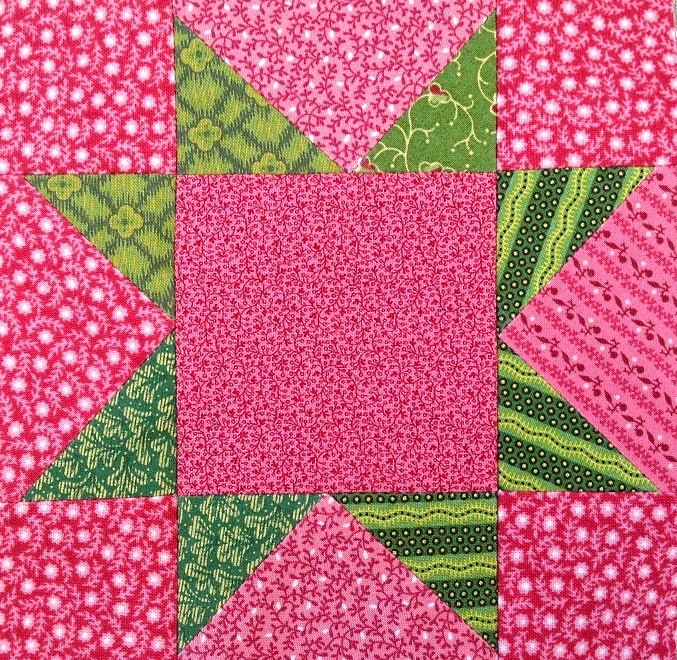 Maybe it is because I have entered too many competitions where judges just don't understand that I am trying to recreate an antique quilt. I am certain if I used this block in a "juried" show the comment would be "should have matched your fabrics better". Of course when I chop off points or make a crooked seam, it is all intentional, so that I may enjoy the experiences of our foremothers! But seriously, I am trying to follow Barbara's "suggestion". I love this one and it was pretty easy to make that one different point. In fact, it may not be noticeable enough. 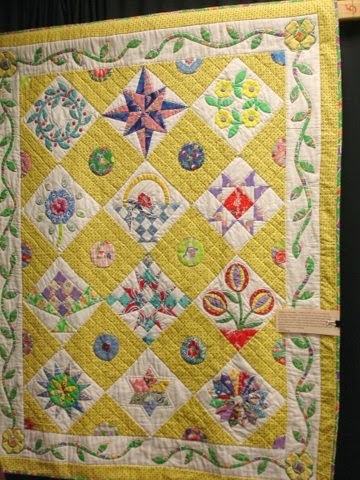 And, speaking of blue - Cyndi and I went to the New England Quilt Museum yesterday to see the Prussian Blue quilts curated by Anita Loscalzo. She gave a superb talk on Prussian Blue, which can also be found in the 2010 Uncoverings published by AQSG. I forgot my camera (Argh!) but Cyndi took lots of photos and will be posting some on her blog so check it out. And if you are in New England I highly recommend getting to the museum before this exhibition ends on April 4. We also realized how much this "color" exercise of Barbara's is working. We spotted lots of indigos in some of the Prussian blue quilts and Anita's talk helped to explain the differences of the two dyes. And for my weekly rant - don't forget to change your clocks this weekend for daylight savings. Seriously?? When are we going to stop this? 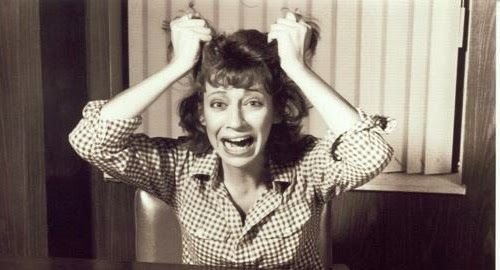 If they really want to mess with time changes, just give us one more hour in the day. I think I could get a lot more done in 25 hours! I just read Victoria's post of her "indigo stars" and I had to interject a comment here. If you are doing this "Stars in a Time Warp" sewalong, I highly recommend viewing Vic's post here , She gives a detailed explanation of the fabric manufacturers she chose. I am so fortunate to have a friend (Cyndi) where I get 99% of my fabrics, that I forget how difficult it is for some people to find good reproductions. If you scroll through some of Cyndi's older posts you will see beautiful photos of her shop. Grab a cup of tea and a napkin to wipe up the drool! Here are my madder "stars in a time warp" for LAST Wednesday. No madder matter how hard I try to get them done on Wednesday nights... well you know! The points on this first block are what I think of when someone says "madder". Those wonderful 1870's browns. This was a stripe and, once again, I tried to think like a nineteenth century woman (I think I do most of the time anyway, at least when it comes to technology!). I love using green with these browns. The background is one of Barbara Brackman's Metropolitan Fair line. I absolutely loved that line! 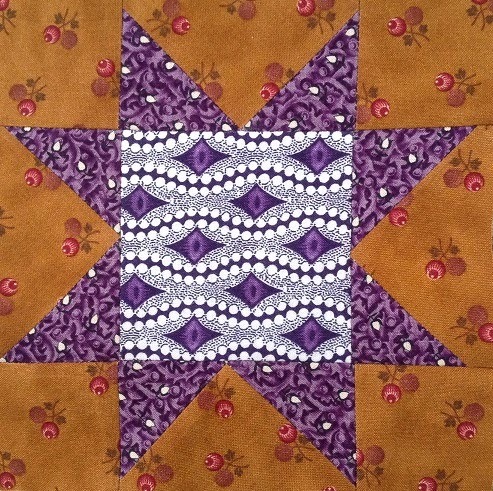 I don't usually follow directions, but Barbara mentioned the purple and red madders too so this next one (again from Barbara's Metropolitan Fair collection) has a wonderful purpley (I don't think that is a real word, except to quilters) color. The backgrounds are from the same collection. Gee, guess I should have trimmed this before taking the photo. As you can see I am not a precision piecer. 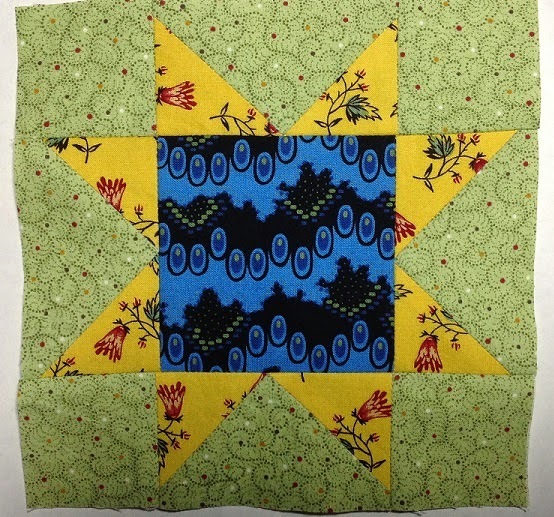 If there was a way to hand applique this block... Oh, well, you get the idea. I actually do better with small pieces and I had a fleeting thought last night (which is why I am a morning person) that I might make a set of these in 3" blocks. I did say fleeting so don't hold your breath, but if I get the urge again, I will post them. Have a great day! And another "reason for quilts"
or should I say another "use for quilts". 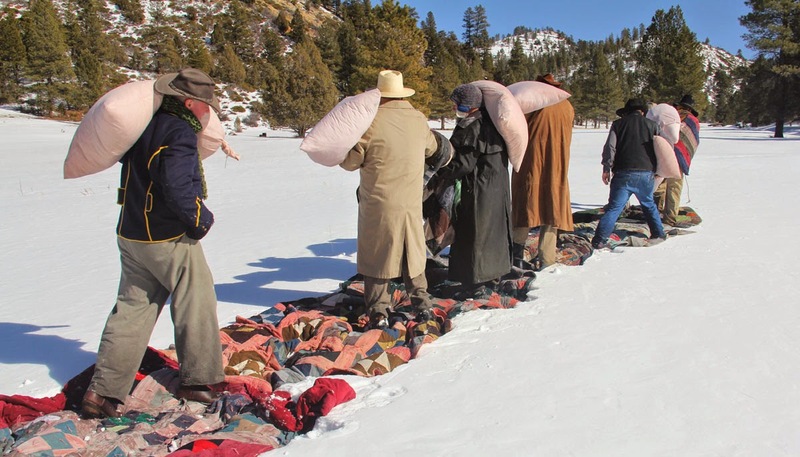 With yet another layer of snow covering the ground this morning, it brought to mind the "quilt walk" of 1864 in Panguitch, Utah. Google it for the full story of this historic trip for food and supplies in the winter of 1864. 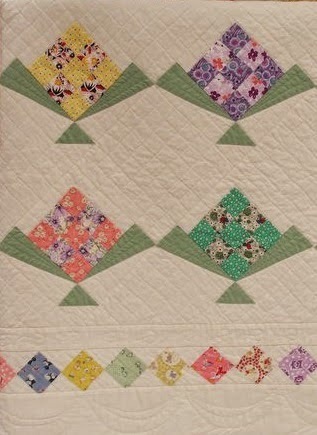 I do feel if we get any more snow I will be laying my quilts on the ground in order to walk next door! Come on crocuses! I know they are under that white stuff somewhere!